What began as a chilling Chicago Halloween weekend quickly warmed up as React Presents brought the heat to the windy city with a bevy of musical talent. The latest iteration of the now infamous Freaky Deaky festival- situated in Toyota Park just outside of the city limits of Chicago- showed once again what a powerhouse of a festival it is with a variance of performers taking the costumed crowds through a mix of bass-infused electronic, indie dance and hip-hop soundscapes. 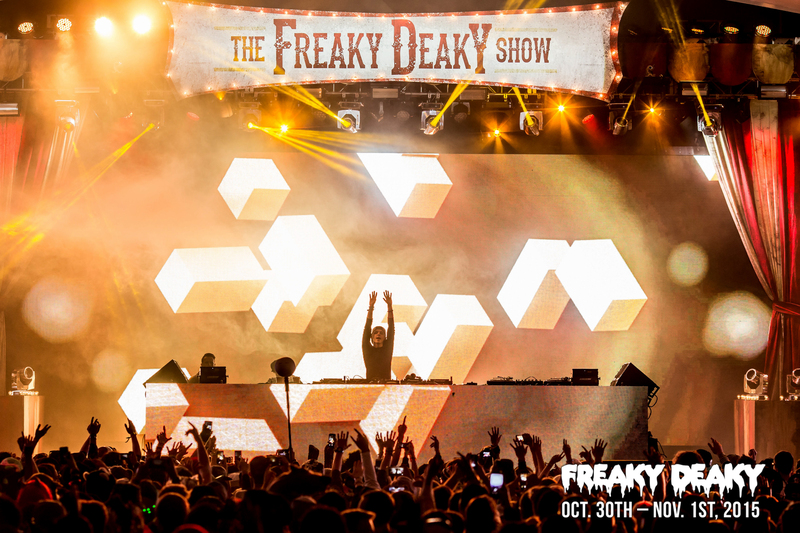 Freaky Deaky provided a variety of surprises for the seemingly weather-proof attendees, ranging from the upscale stage designs and costumed performers (who would have thought A-trak would spin his signature vinyl set completely geared up in a full Batsuit??) to the assembled local Chicago food which kept the festival goers energized throughout the course of the three day weekend. The holiday theme of the weekend resonated everywhere from the hilarious sights of shuffling zombies, decapitated stage dancers and headbanging ghouls and goblins. While there were predicted spotlight-stealing performances over the course of the weekend with headliners such as Big Gigantic, Gesaffelstein, Carnage, 2 Chainz, and Bassnectar but we at MMIBTY have compiled a list of the 5 personal favorites over the course of the three days. 1.) Oliver Heldens: The 20 year old prodigy from the Netherlands showed no signs of slowing down once he took over “The Big Top” stage. Outfitted in his monk’s robe and serving up fresh beats were two of the immediate takeaways from his set. The young producer showed musicianship beyond his years by incorporating nods to his inspirations by mixing in a variety of different influences such as Beastie Boys and Run DMC along with his recent hits such as “Gecko” and “Shades of Gray”. 2.) Hermitude: The duo from Australia proved they were capable of playing the mainstage when they took over Saturday with their signature synths and blended live performance. Playing out a variety of different genres, they paid homage to their Australian counterparts by playing a medly of fan-favorites as well as mixing in a variety of remixes from the likes of Flume, Anna Lunoe and their own signature sounds. 3.) Justin Martin: One of the head proprietors of the signature Dirtybird records, Justin Martin set out to fulfill the necessary quota of womps and wiggles of the weekend by immediately throwing the crowd into a frenzy. Playing the aptly named “Crypt stage” Justin’s jovial smile and heavy electronic thumps blended nicely with the ominous glowing skulls hanging over the stage while his devoted fan base jumped in unison to every drop of his song “Don’t Go”, making those of us in the crowd wish his set wouldn’t end. 4.) The Magician: Having to compete on the main stage with artists such as Big Gigantic and Mac Miller, The Magician served up a signature high-energy set complete with nods to all sorts of house legends over the course of the hour. His personal selection of some of the hottest records on the planet rang true- we noted he spun several dozen hits over the course of his hour set, ranging everywhere from The Aston Shuffle to Annie Mac to his own bass infused singles. The Magician stayed true to his name by enchanting the crowd and had every head in the house nodding and shuffling to his sounds. 5.) Pretty Lights: Rounding out our top 5 sets of the Halloween weekend was the originator of an entire musical awakening himself. Otherwise known as Derek Vincent Smith to his devoted following, the Colorado native took to “The Big Top” stage accompanied by his glitchy hip-hop beats and complex visual stage design. By the time he played his now legendary classic “Finally Moving” the crowd was in full swing and definitely feeling the energy he brings to each and every one of his memorable live performances. Altogether Freaky Deaky provided another fantastic event catering to many current genres of the electronic and hip hop music scene. This festival added another reason to put Chicago on your radar for future Halloween weekends and we can’t wait to see what React Presents comes up with next year! All article photos courtesy of Da Black Swan.